Avoided deforestation has become a buzz word du jour. It is estimated that deforestation accounts for 20% of current emissions, and that the carbon emission trading market is worth about US$30 billion at present. Including carbon credits for avoided deforestation as part of emissions reductions schemes seems a win-win solution. However the graph below illustrates the challenges ahead. This shows the relationship between forest cover and governance in 2005 for 40 developing countries accounting for about 750 million hectares of primary forest taken from FAO data. The governance score is taken from the indicators compiled by the World Bank: the scores range from -2.5 to +2.5 with the higher values indicating a more positive governance outcome. There are six broad categories: voice and accountability, political stability, government effectiveness, rule of law, regulatory quality and control of corruption. The latter is used here, although frankly the results hardly change with any of the others. Brazil is the outlying spot on the far right. 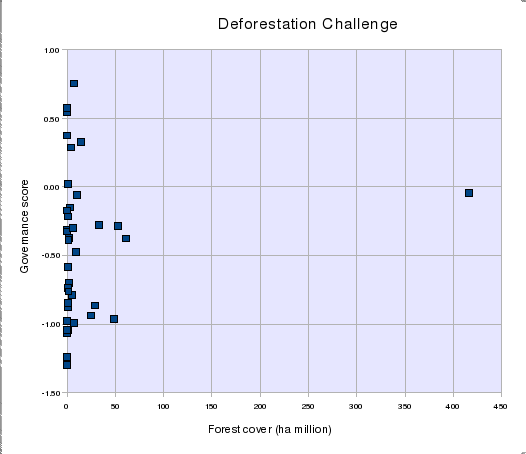 The Democratic Republic of Congo in Central Africa should be in the centre of the chart in terms of forest area, but there is no comparable primary forest data, and with a corruption score of -1.39 (which is also its best score) it would lie on the bottom. In an earlier post I made an argument for a market-based approach, with the market pricing carbon according to risk for individual countries so providing an incentive for governments to introduce governance reforms themselves, supported by bilateral and multilateral aid programmes.